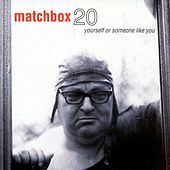 Believe it or not, Matchbox Twenty had been together for just over a year before releasing their debut. Yourself Or Someone Like You was a massive success thanks in large part to the group's knack for grafting arena-sized hooks to jangly alterna-pop (think the Gin Blossoms crossed with Collective Soul). With his rich and deep voice, Rob Thomas is the superstar x-factor, coming off like a cute and cuddly Eddie Vedder. The big hits were "Push" and the charmingly restless "3 a.m.," but "Long Day," "Real World," "Back 2 Good" and "Girl Like That" all found their way on to mainstream radio. 1996 Atlantic Recording Corporation for the United States and WEA International Inc. for the world outside of the United States.